The Mediterranean Diet is reflective of various eating traditions in countries surrounding the Mediterranean Sea. Travel abroad isn’t necessary to enjoy these culinary favorites – fresh foods and delicious flavors are as close as your local supermarket! Traditional Mediterranean Diet eating patterns may help protect the brain, reduce heart disease risks, fight cancers, protect against diabetes, prevent depression and aid in weight management. Remember, these health benefits come from the synergies of eating the right balance of plant-based, nutrient-rich foods and not from eating a single superfood. 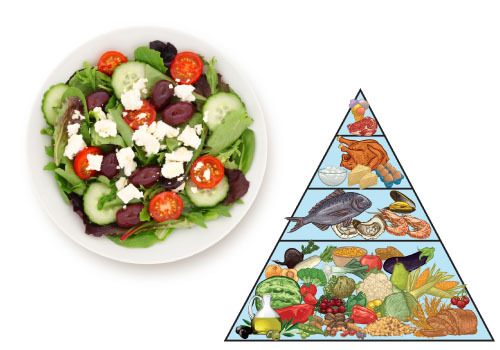 Start making simple changes to the way you eat – embrace Mediterranean eating from the bottom up! Eat lots of vegetables – they are vitally important to the fresh tastes and flavor profiles of the Mediterranean Diet. Switch to whole grains – they are rich in many important nutrients with extra fiber to keep you fuller longer. Cook at least one vegetarian meal each week – include beans, whole grains, vegetables and fragrant herbs and spices for added flavor. Enjoy fruit as dessert – in place of less healthy sweets which should be reserved for special times. Eat seafood twice a week – their omega-3 fatty acids have beneﬁts for brain and heart health. Enjoy dairy products in modest amounts – limit cheeses and include Greek or plain yogurt (they’re versatile ingredients in recipes). Change your focus around meats – make meat a garnish instead of the focal point of your meal. Choose healthy fats – include extra virgin olive oil, nuts, peanuts, sunﬂower seeds, olives and avocados.